This is the second in a series of posts for new and potential bird watchers who are just getting introduced to the world of birds. Now that you have some idea of why many people watch birds, it is time to understand what tools one can use to become a better birder. What precisely is ‘better’ is debatable, but includes identifying and documenting birds in the field, while also gaining an understanding of birds and their ecology. The most important tools to observe birds are the simplest – your eyes, your ears and some of your time. To be able to identify and understand birds, it is important to use both visual and aural cues. For example, some very similar looking birds may be best distinguished from each other by their calls or songs. Similarly, birds which have similar calls and songs may look nothing like each other! 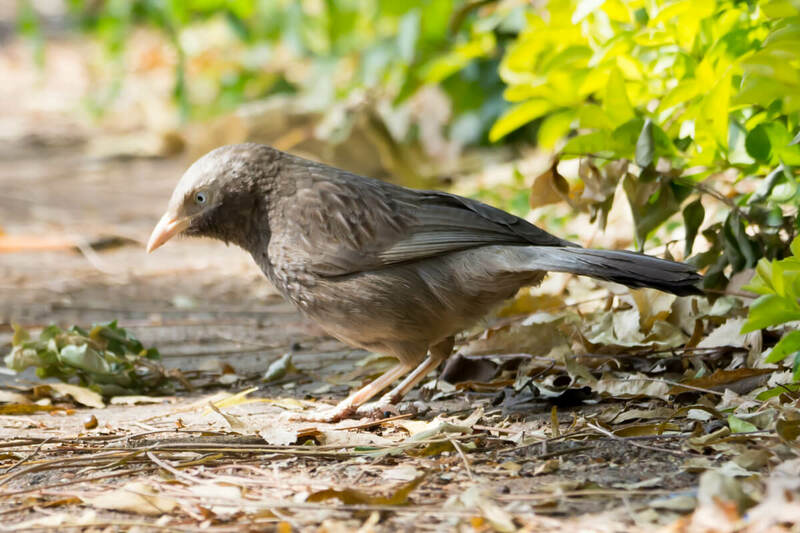 Above: The Jungle Babbler (listen to sound) and the Yellow-billed Babbler (listen to sound) may look similar, but sound very different. 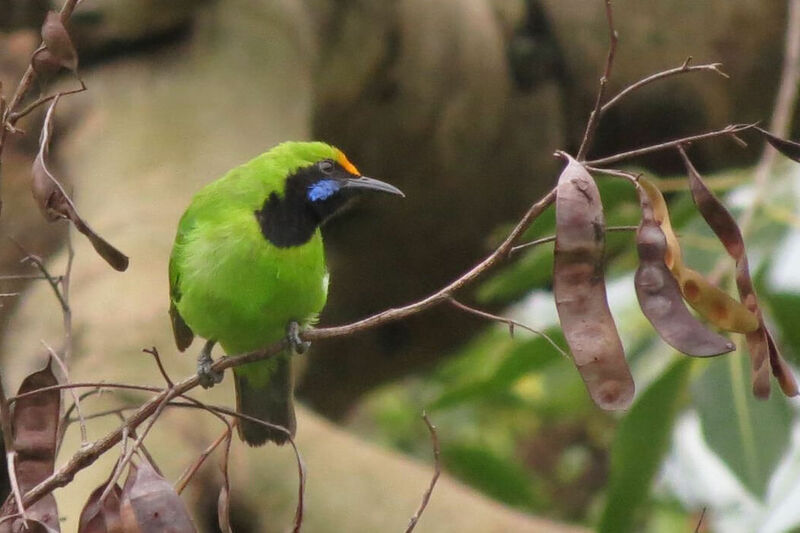 Above: They look very different but Ashy Drongos (listen to sound) and Golden-fronted Leafbirds (listen to sound) can sound just like each other. 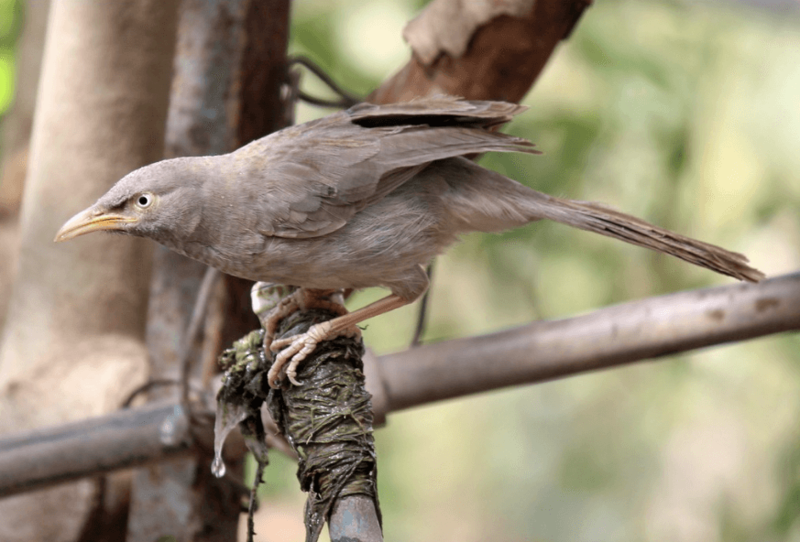 When it comes to observing birds, although it is often best to deduce characteristics based on what is visible, a song/call may often give away more about a bird’s behaviour than its posture or movements. Observing the bird isn’t merely about looking at or hearing a bird, but also using your senses to gain an understanding of its habits and habitat. Ask yourself questions about what you are seeing or hearing, and then try and answer them through your observations. Some examples: Why is the bird behaving as it is? What is it feeding on? Why does it always prefer an open perch/or why does it forage only in the leafy canopy? 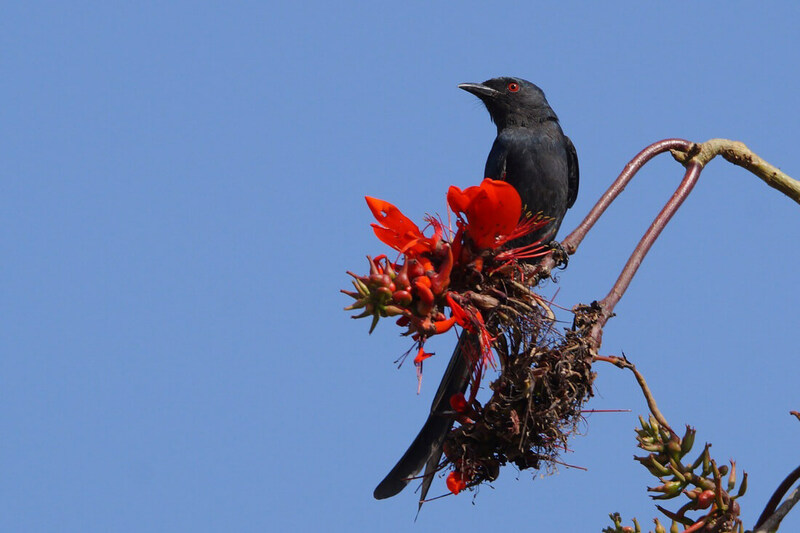 Is it frequenting a particular spot very often – could it have a nest nearby or is it simply announcing its territory? Is the call indicative of stress – does the bird sense danger, is it a signal to ward off competitors or is it a song to announce itself to a potential mate? Is the bird usually solitary or in pairs or in groups? Noting these differences will also help you appreciate the distinctiveness of each species/genus/families outside of just physical features and vocalizations. Penguin on the right (mouth shut, but ears and eyes open): Great birder! Most importantly though, any good birder must always be patient. One of the challenges of birding lies in not having control over your subject. All too often, the best observations are made by those who have the time and patience to allow the bird to move into a better position for viewing or give it a chance to become more comfortable in the presence of a human observer. 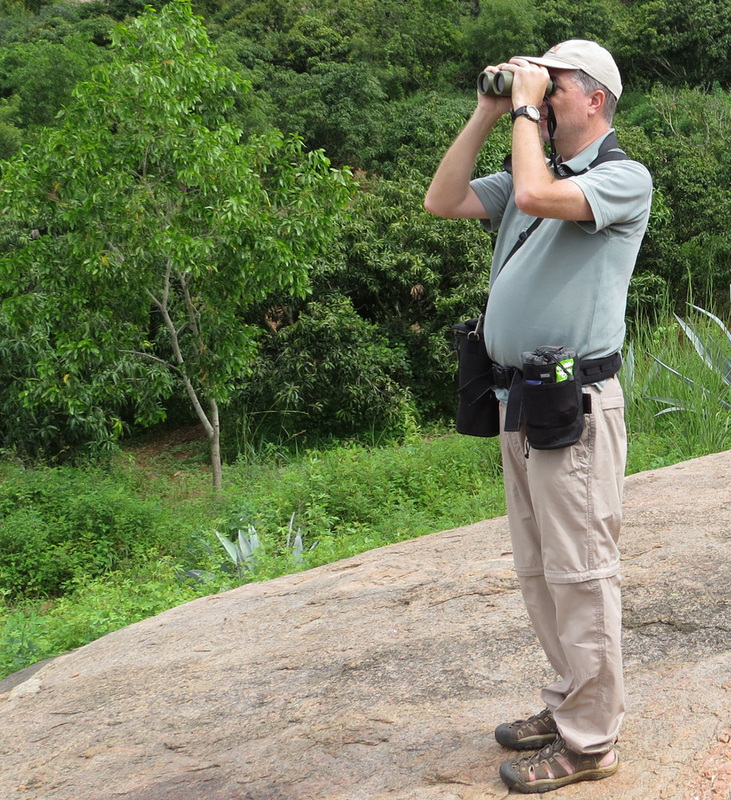 Binoculars are indispensable for a good birder. One of the best ways to tell a birder/birdwatcher apart from the crowd is to look out for the binoculars hanging from his/her neck or shoulder. A birder without a pair of binoculars is akin to a bird without its feathers. Having binoculars not only helps in getting a closer look at the birds, but also helps one to understand and appreciate the subtleties of plumage, colour, movements, and more. There’s a wide range of binoculars available in India nowadays – in terms of quality and price. Before making a choice on what to buy, it is perhaps best to understand what specifications and factors to look for in your potential pair of binocs. You can learn more about what to look for in a pair of binoculars here and here. A notepad/notebook and pen/pencil are two of the most useful things for a birder to carry in the field. 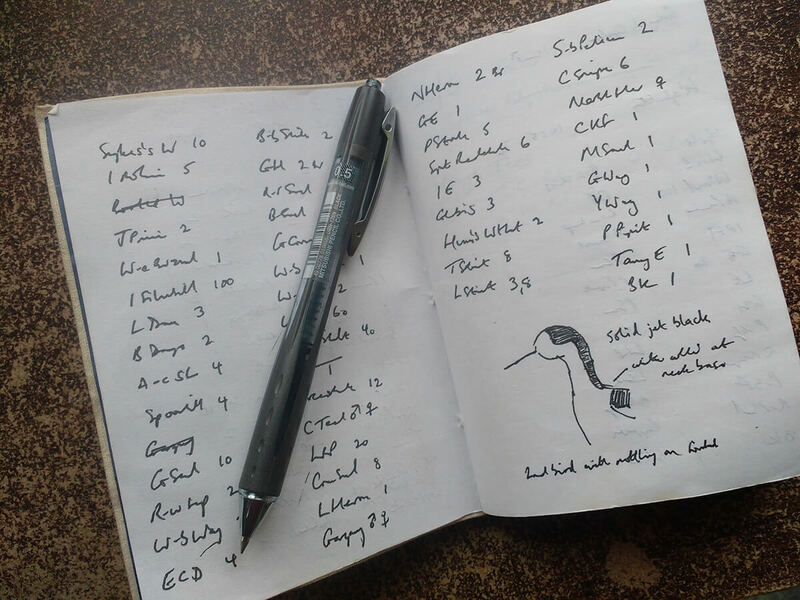 One can use the notepad to write down the basic details of a birding session such as the time, weather, location, & habitat, and also to keep lists and maintain notes and field observations. Drawings and descriptions of what bird you saw (more in the next article about how to write descriptions) are often the most useful tools for identifying species later. Your notepad can also be used to write down other observations about the bird and its behaviour as well as its surroundings. With the new eBird mobile app, smartphones have replaced notepads in many ways (especially in listing) but most good birders would still vouch for the good old pen and paper when it comes to making the best field notes! A field guide is a book that acts as an illustrated guide to the birds of a particular region. It should ideally be lightweight, handy and easy to use and carry. While many birders may not actually carry a field guide in the field – often relying on field notes and using those against a field guide later, a good one is a must for any birder. There are a number of field guides currently available to choose from; depending on your needs and level of expertise, your choice of field guide may vary. 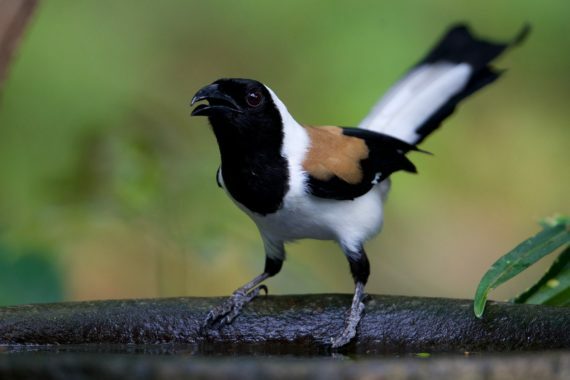 While the latest field guides (such as The Birds of the Indian Subcontinent and Birds of South Asia) are excellent and mostly up-to-date, they can also be fairly complex and are usually meant for those who have been birding for at least a short while. Some of the older field guides (such as A Field Guide to the Birds of India) remain useful and relevant as well. However, for beginners, very few field guides are as interesting and fun to read as Martin Woodcock’s ‘Collin’s Birds of India’ and Salim Ali’s ‘The Book of Indian Birds’. If you are new to birding, then picking these guides is well worth it. They may not be up-to-date or list all species, but they remain amongst the best introductions to the world of Indian birds. Binoculars, a notepad, a pencil and a field guide may be all that is needed to be a good birder but one can always take the next step and procure a spotting scope and/or a camera with a long zoom. A spotting scope is essentially a small telescope with a large magnification that allows one to observe the details on birds far away. Your first view of even a common bird through a good scope will always provoke a “wow” reaction! Spotting scopes are usually a little heavy, need a tripod, and tend to have a steeper learning curve than binoculars, but can be very useful, especially in open habitats such as wetlands. Today, there are a number of cameras (inexpensive and expensive) with a long zoom. These can be very useful in obtaining images and videos for documenting the birds you are seeing. Although photographs can compensate for lack of field notes, it’s better to have a mix of both to get a complete picture and make sense of what you saw. You may also use your cameras and mobile phones to record sounds – a habit that will definitely help in learning calls and songs better! Is anything missed out on in this article? Do give your inputs in the comments section below. From the ones mentioned above, the most popular field guide for use by birders who have been birding for a year or more is the Birds of the Indian Subcontinent ( http://www.amazon.in/Indian-Subcontinent-Richard-Grimmett-Inskipp/dp/019807722X ). It is relatively up-to-date and covers all species found in India. How about MAGNUS OPUM BIRDS OF INDIA by Bikram Grewal? I have not used it myself, but the reviews for the book have been pretty good. However, there are certain advantages to having an illustrated field guide as opposed to a pictorial field guide in terms of how well they depict certain species and their characteristics. At the end of the day, I would suggest using whatever you feel most comfortable with. Do take your time and try out different field guides before zeroing in on one. Good luck! I have been into birding for the last two years. Although I started with a interest in just photographing the birds. But slowly I am getting serious into birding rather than just photography. I have been looking for such article for last few days. I wanted to know more about how to write notes and counting methods to make birding in a useful manner. There are few of us who are into birding but mostly for photography. I want to change this into much fruitful activity than just getting frustrated when we can’t get good shots. Please give me some suggestions in this regard. Thanks for this, Sir. We hope to gradually build a set of articles/resources for both those who are starting out as complete beginners; as well as for others like you who have been birding already, but are interested in exploring the activity in more depth. Please consider subscribing to our newsletter (top right of this page) so that you’ll be sure to get updates. Thank you again! Thanks for the reply. I have subscribed the newsletter, hope to get enriched more with your future articles.